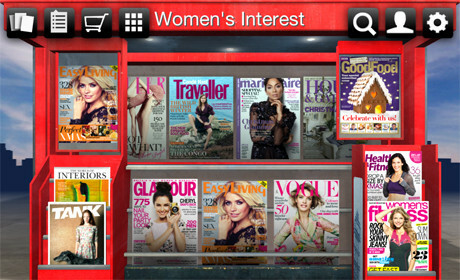 It has been five months since virtual newsagent app lekiosk launched in the UK. The app, which is a marketplace for digital editions of magazines, started in France. Influenced by the impact of the iPod on the music industry, the company looked to produce the app, which operates as a virtual, 3D kiosk for magazine and newspaper publishers, at the same time as the iPad launched in France. Today the app reports to have 600 French titles available through its platform. Outlining its success co-founder Michael Philippe told Journalism.co.uk the platform's success in France "is based mainly on three pillars" of the model: the technology, the bundle offer and the content. He said the company tends "to develop technology that fits perfectly with the tablet experience, which means an experience where you have nothing to explain to the consumer, everything is simple, fast and intuitive". And its bundle offer for users of 10 magazines for £10 a month, said to be "based on the success of services like Spotify", currently has more than 30,000 subscribers. "We think that those models are very efficient in the digital industry," Philippe added. There is also the option for users to purchase single issues. In terms of content, as well as 600 magazines in France, following its expansion into new countries lekiosk is also said to be working with 100 titles in the UK and 100 in Italy, where it launched earlier this month. "The idea is really to build this marketplace because we think that it has a great value for the consumer if you can find all your magazines in one single place," Philippe said. The kiosk is already working with publishers in the UK such as Dennis and Conde Nast, Philippe said, adding that the company is "quite confident we will be securing all the major publishers quite soon". Publishers which have pdf versions of their magazine can place titles onto the platform for free, with the app taking a cut from any sales made. "I think the print edition still has a great value in the tablet market," Philippe said. "We believe in the print edition because we're sure now people are willing to actually pay for it." The digital kiosk is available as an Android app, a web app and an iOS app. Philippe added that the app is also "very different" from Apple's own Newsstand platform, referring in particular to its "focus on the print edition" and bundle offer. As well as its launch into Italy earlier this month, lekiosk also announced it had secured $7.1 million in funding from CM-CIC and FSN PME CDC Enterprises. In a release chairman of lekiosk Ari Assuied said the funding "will enable us to continue with our investment into the UK service, as well as our international expansion into new markets". He added it will also be used "to continue to develop lekiosk to make it a more social and interactive experience for users, as well as investing into our core platform strategy as we open up lekiosk to new platforms like Windows 8."